Electric motors run maintenance-free most of the time; many are self-lubricating and only occasionally require the oil wells to be topped up. Many of the parts in an electric motor are effectively non-serviceable as a do-it-yourself task, such as the windings, but you can replace the brushes that make contact with the armature. Worn brushes are often responsible for a motor that turns slowly, as the contacts break down and current can't be applied. 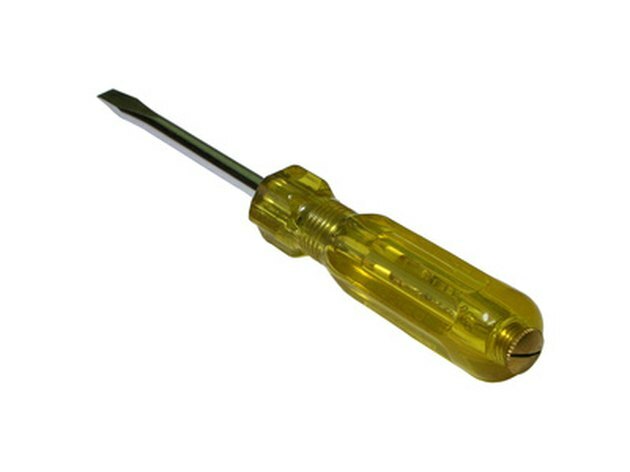 A screwdriver is genarrly all you need to get your motor working again. Pry out the ring clips from the brush holder using a screwdriver and a pair of pliers. They are usually on the back of the electric motor. Pull out the two metal springs from their retainers and then remove the brushes. When they are worn there is very little to remove, but make sure they are out completely. Insert new carbon brushes into the retainer compartment; push them in using your fingers. Insert the springs behind the brushes. They won't go totally inside the retainer due to the size of the new brushes. Push the springs into the retainer using a screwdriver, then insert the ring clips into the retainer. This holds the springs and brushes in place. Start your electric motor. You will find it sparks for a while around the brushes until they bed in. Your motor won't operate at full power immediately, but leave it running for a while and once the brushes are bedded in the motor will operate normally. What to Do About Noisy Bearings In a Ceiling Fan?